Mr. Aubrey Holland was just a regular guy living in West Conshohocken in 1943. Family and friends knew of him as “Sam”. He worked as a machinist at the John Wood Manufacturing Company of Conshohocken. World War II was raging throughout Europe and Asia. Like many in the United States, Mr. Holland honored the call of the nation and served in the United States Army during World War II. Mr. Holland was one of 22 men of West Conshohocken who joined the United States military on the same day – March 5, 1943, according to a news article dated March 9, 1943, in The Conshohocken Recorder. He returned home, though, as a different man. In the United States Army, Private Holland served as a medical corpsman. This was Cassino, Italy. The community is located to the southeast of Rome. This area was the scene of four battles. 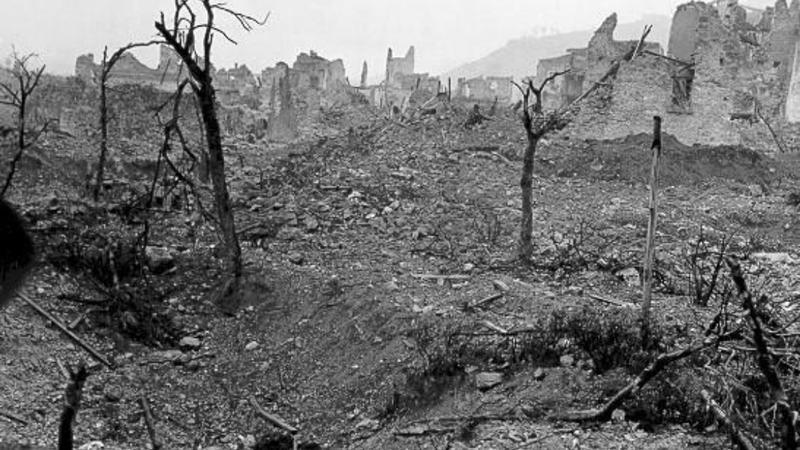 The top photograph shows the ruins of Cassino following those battles in 1944. Casualties from the battles included many from the Allied nations fighting the Germans that had occupied this section of Italy. Many members of the militaries of the United States, the United Kingdom, New Zealand, Poland, Canada, Australia, France, and other nations lost their lives or were injured in the battles to free Cassino and the immediate area from German occupation. One of the men who was injured and survived was Private Holland. German paratroopers at one of the battles of Cassino in 1944. Italy had surrendered to the Allies, but Nazi Germany did not accept such betrayal. Nazi Germany occupied Italy. Italian troops not loyal to Germany were disarmed and worse. The Allies now had to fight the Germans to take Italy. Nazi Germany would not make it easy, simple, or quick for the Allies. Lines of defense were established by the Germans across Italy to stop the Allies from advancing from the south of that nation. One of the lines – the Gustav Line – ran through Cassino. 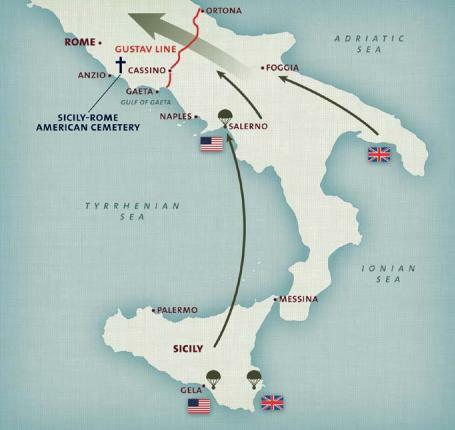 To get to Rome – one of the key goals of the Allies – the troops would have to break the Gustav Line. It would not be easy, simple, or quick. Monte Cassino provided unexcelled views throughout the valleys and countryside in the region. The Germans mined the area. Barbed wire impediments were employed. The Gustav Line – the red line on this map between the Adriatic Sea and the Tyrrhenian Sea – was one of the defensive lines established by the Germans to hold the bulk of Italy. Cassino was situated on the Gustav Line. 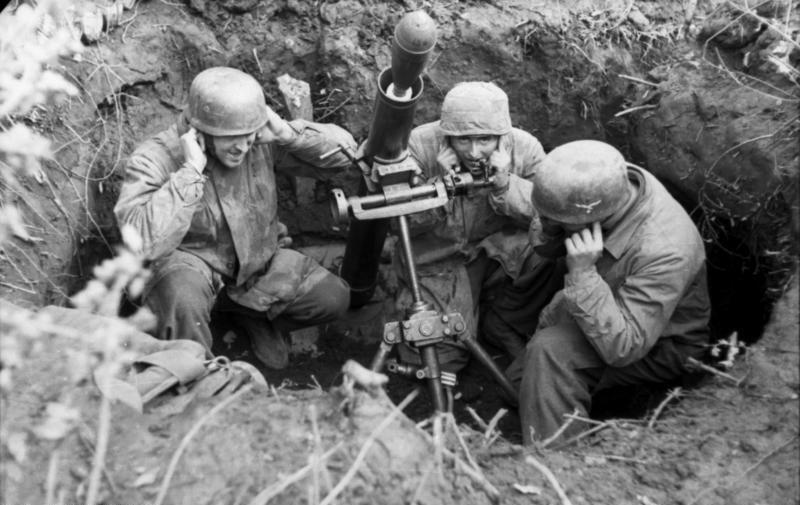 The Battles of Cassino – as noted, there were four in total – lasted from January 17, 1944, through May 18, 1944. Brits, Indians, Canadians, Americans, French, New Zealanders, Australians, Moroccans, Algerians, Tunisians, South Africans, and others fought at Cassino. Among those at the front with the Allies were female ambulance drivers with the Second Moroccan Division of the French Army. According to several reports, including in the book “Monte Cassino: Ten Armies In Hell” by Mr. Peter Caddick-Adams, the American commander, Lieutenant General Mark Clark of the United States 5th Army, was against having women at the battlefield. The women of the Second Moroccan Division of the French Army stayed at the front. 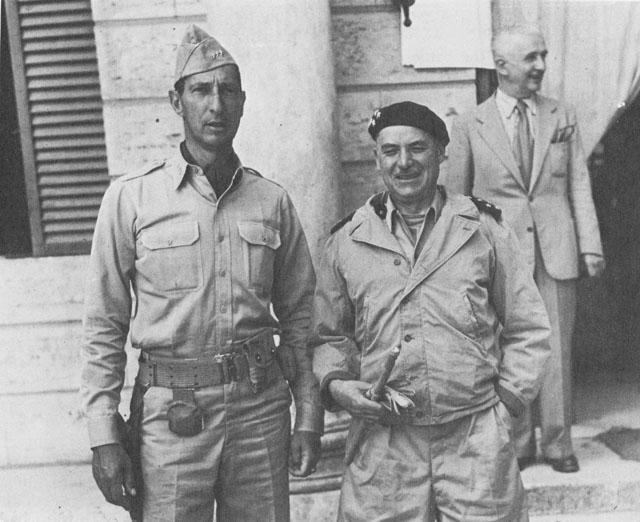 Lieutenant General Mark Clark of the United States 5th Army is seen, to the left, with General Alphonse Pierre Juin of the French Army in Sienna, Italy, in July of 1944. Cassino was eventually taken and the Gustav Line was broken. The Allies could then move on to liberate Rome. The cost at Cassino was high. To both the Allied and German military forces. According to the book “Real History Of World War II: A New Look at the Past”, written by Mr. Alan Axelrod, German casualties included about 20,000 injuries and deaths at Cassino. The cost to the Allies was much higher. According to the book, Allied casualties included about 54,000 injuries and deaths. Today, you can travel to Cassino, Italy, and visit national cemeteries holding the remains of the sons of Poland, the United Kingdom and other Commonwealth nations, and the United States, among others. Sicily-Rome American Cemetery and Memorial is the final resting place for many of the men who died at Cassino as well as other military campaigns to free this section of Italy. There are 7,861 gravestones of American military war dead at this cemetery. 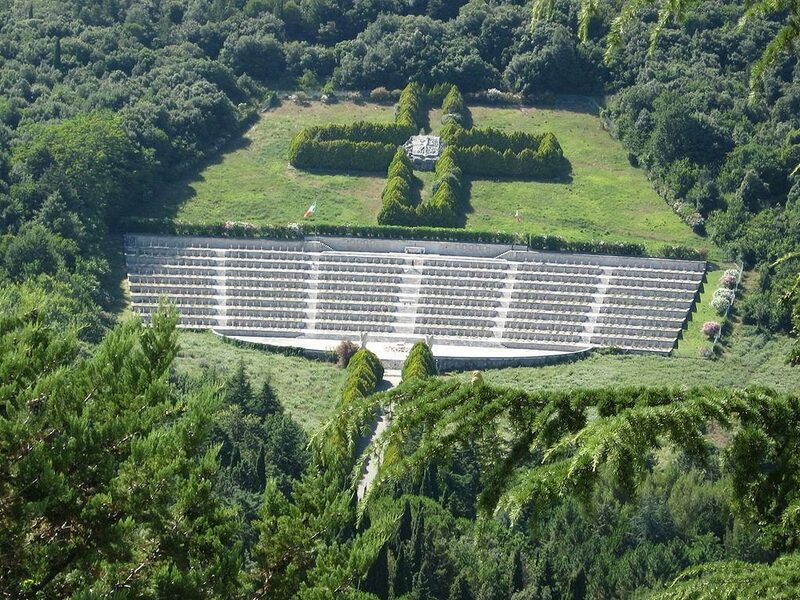 This is an aerial view of the Polish War Cemetery at Monte Cassino. There are 1,072 graves of Polish soldiers at this cemetery. The English translation of the Polish inscription of the memorial at this cemetery, according to the Montecassino Abbey. One of the casualties of Cassino was Private Holland. During the night of January 21, 1944, the life of Private Holland was altered forever. He was grievously wounded early in the first battle at Cassino. Multiple news reports detail the situation that Private Holland found himself in that night. As he gave aid to a wounded soldier on the battlefield, a bullet hit Private Holland in his arm. Though injured himself, Private Holland took the wounded soldier to a safer place. He then took three other wounded soldiers to an aid station. As the four walked to that aid station, a shell fragment hit Private Holland in his left leg. His leg was now broken. He used cloth to make tourniquets on his arm and leg. Either one hand or both hands (there are reports of both) was/were also frost-bitten. He lay in the battlefield for 4 days as war ranged on between the armies. As he lay there, he developed pneumonia. He stayed alive with water from his canteen. That “searching party” that Private Holland alluded to in 1944 was identified in news articles in 1946. The offer of a cigarette and water showed that humanity still existed in Hell. A second newspaper confirmed the account that German Nazis came to the aid of Private Holland. A news article dated February 6, 1946, in The Philadelphia Inquirer, reported that a Nazi patrol had “signaled to American medical corpsmen” that there were two American survivors – including Private Holland – that needed help. 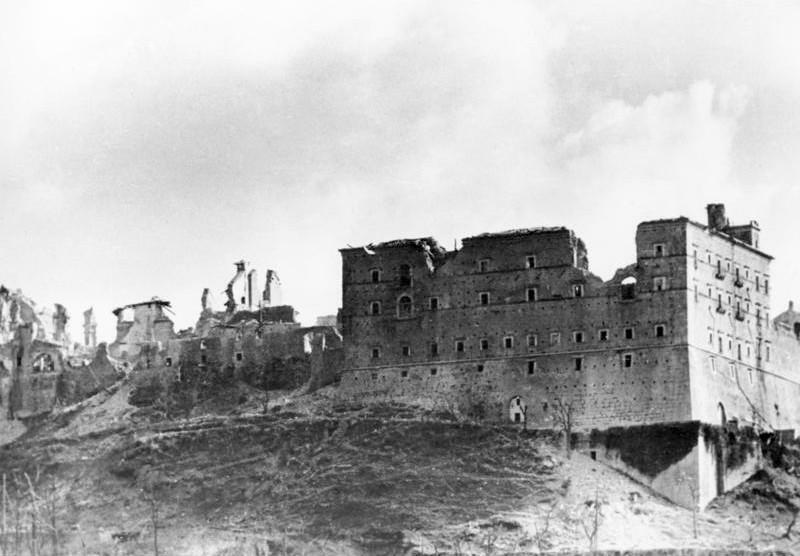 It may seem unusual that enemies – Americans and the Allies on one side and the Germans with some Italian support on the other side – could cooperate, but there evidently were several truces during the Cassino battles where the Allies and the Axis armies stood down while the injured and dead from both sides were moved from the battlefield. According to the book “Monte Cassino: The Hardest Fought Battle of World War II”, written by Mr. Matthew Parker, there were times where both sides worked together. Mr. Parker provided a reason why it may have been Germans who found Private Holland. It may have been part of a strategic effort to minimize future casualties on the German side. The piles of bodies described by that unnamed veteran were confirmed by another military veteran from western Pennsylvania. On the same date that Private Holland was struck down, Private Albert DeFazio of Penn Hills was at the same battle. In “One Soldier’s Story of a Forgotten War”, a book written by his daughter, Ms. Valerie DeFazio Vacula, Mr. DeFazio (now Mr. Albert DeFazio, Sr.) detailed what he witnessed as a member of the United States Army during the battle. It was this landscape where Private Holland laid waiting for assistance for four days. 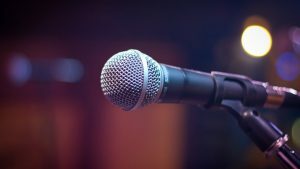 Initially, his family was not told of his actual injuries. A sister-in-law to Private Holland, The Conshohocken Recorder reported in a news article dated March 7, 1944, had received a letter at her home in Connaughtown from the wounded Private Holland; in the letter, he indicated that he “had suffered a broken leg”. His actual injuries, though, were far more severe. Once he was taken to a military hospital in Italy, doctors found that he had gangrene. His right leg was amputated immediately. He returned to the United States on June 14, 1944 – Flag Day – according to a news article dated February 8, 1946, in The Conshohocken Recorder. The specific hospital he went to initially in the United States is uncertain. According to a news article dated August 16, 1944, in The Washington Post, Private Holland was first sent to a hospital in West Virginia; he was later moved to the Walter Reed General Hospital in Washington, DC. Other news reports only note that he was sent to the Walter Reed General Hospital. The left leg of Private Holland was amputated in July of 1944. He returned to West Conshohocken in 1945. 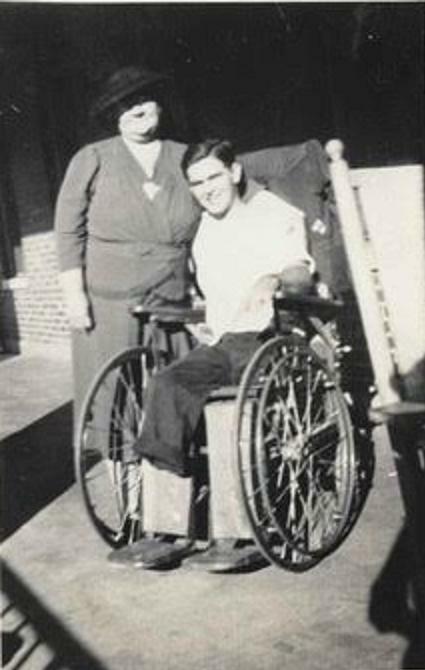 Mrs. Hannah Elizabeth Holland with her son, Private Aubrey (Sam) Holland, at the Walter Reed General Hospital in 1944. For his service to our country, Private Holland was awarded the Silver Star for an act of bravery during the campaign along the Rapido River in Cassino. For the wounds he suffered, he also received the Purple Heart with Oak Leaf Cluster. 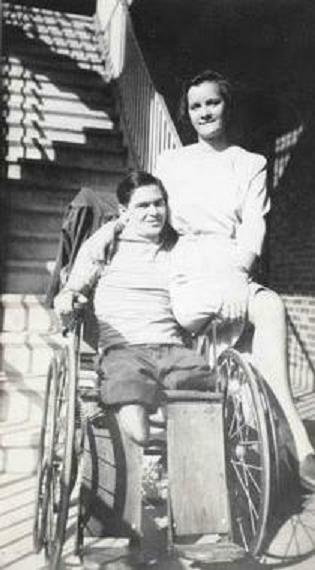 Miss Doris Jane Ruth with Private Aubrey (Sam) Holland at the Walter Reed General Hospital in 1944. The two were married on March 31, 1945. The word “hero” is used by many today to describe a variety of people who do outstanding work. Sometimes, the word “hero” is bandied about as a clever description of someone who did something special, something different. Sometimes, the word “hero” does not do justice in describing a person. 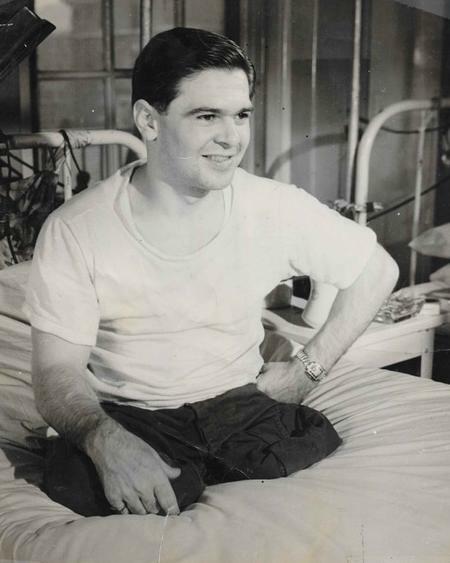 Private Aubrey (Sam) Holland, at Walter Reed General Hospital in 1944. Private Aubrey (Sam) Holland of West Conshohocken, with his actions in Italy, certainly meets the definition of a hero. The Abbey at Monte Cassino was destroyed during World War II, but re-built afterwards. The landscape of today is much different than what it looked like in January of 1944 as Private Holland lay with grievous wounds on the battlefield. Part III will focus on the love story between two sweethearts from West Conshohocken who decided that the wounds of war would not separate them. How one man and one woman helped give hope to each other as well as to a nation. Part III will be published tomorrow. Part IV will explain the ups and downs – the human frailties – and the love between this family and their neighbors throughout the Freedom Valley. Part IV will be published on Saturday. Part V will give a perspective from Jewish individuals on how human compassion and kindness could occur in the midst of a hellish situation. Part V will be published on Sunday. These news columns may give you hope and give you reason to offer thanks on this Thanksgiving Day Holiday Weekend. The photograph of the German paratroopers at Monte Cassino is provided courtesy of Bundesarchiv, Bild 101I-577-1917-08 / Haas / CC-BY-SA 3.0, 1944. The photograph of Monte Cassino in 1944 is provided courtesy of Bundesarchiv, Bild 146-2005-0004 / Wittke / CC-BY-SA 3.0, 1944. The map of Italy is provided courtesy of The American Battle Monuments Commission. 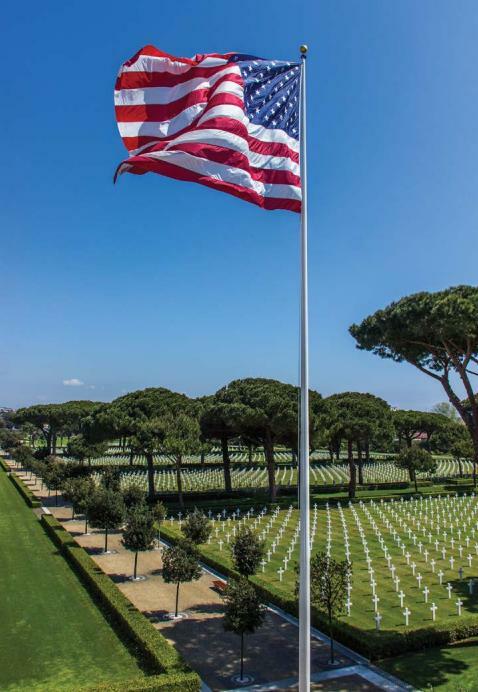 The photograph of the Sicily-Rome American Cemetery and Memorial was taken by Mr. Rich Arsenault and is provided courtesy of The American Battle Monuments Commission. The photograph of the Polish War Cemetery at Monte Cassino is provided courtesy of Pilecka, 2007. 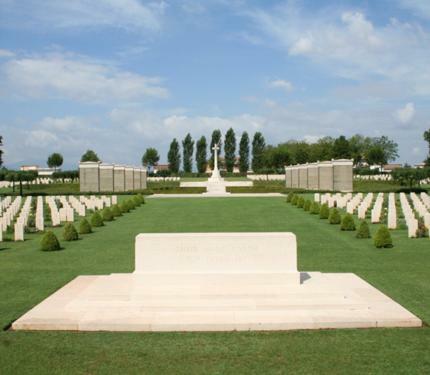 The photograph of the Cassino War Cemetery is courtesy of the Commonwealth War Graves Commission. The photograph of Lieutenant General Mark Clark and General Alphonse Pierre Juin is provided courtesy of the United States Army, 1944. The photographs of Private Aubrey (Sam) Holland alone and with family members at the Walter Reed General Hospital are courtesy of Mr. Scott Holland, 1944.